I think that Effinex running with all of those hives yesterday was not in the best interest of the horse. I just wanted others opinions on the decision to run him yesterday. I don't think it was right either. Couldn't tell but if he was put to the whip, wouldnt it have hurt? Someone commented on the bigger board comments that if he had complained, they would not have run him. Don't they think refusal to enter the starting gate is a complaint? He finally went in without his rider. Maybe the rider's legs had to grip his sides in order to fit through the entry to the gate. May have hurt. This is an experienced race horse who knew about starting gates. Not like he was new to them. He still managed to do pretty well. I watched that race and seem to remember he came in 3rd or 4th. Mike Smith was his jockey and he isn't heavy-handed with the whip. Melatonin ran such a good race, no one was going to beat him; he won by 5 lengths and Effinex was almost in 2nd, but well behind the winner. 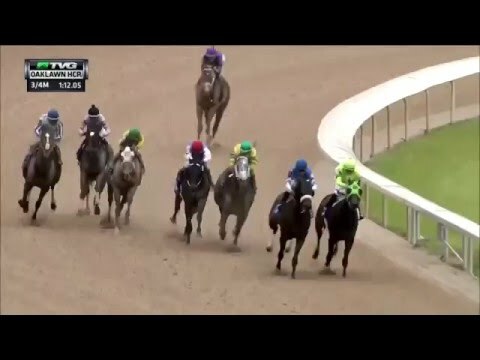 Effinex is a weird, quirky horse - this is not the first time he's acted up before the start. Oh. I haven't followed him. Think this is only the second time I've seen him run. Most horses his age have it down pat by now . . . Effinex is just really quirky. Supposedly one of the reasons Mike has taken over. Oh, wow, that was wild. I see what you mean. Thanks for posting. By the way, do you know who the grey horse was. He has a beautiful, mesmerizing gait. Didn't do very well, however. I'll see if I can find out who it was. Well, his name is Wealth to Me. He was 8 years old in that race. He was an early Tapit, foaled in 2007. Hope he gets a good retirement eventually. He's a gelding. Hives (urticaria), like what Effinex is suffering from can sometimes be hard to pinpoint as the actual cause for the condition. Unfortunately, it is usually a time consuming process of elimination to try to narrow down the antigen resulting in hives both for internal/systemic and external/environmental exposures. Stress can also cause hives both in humans and animals too! When the urticaria condition is in full bloom with "bumps", the under layer of skin (dermis) can become highly sensitive and can be "hot/feverish" and sometimes be accompanied with unbearable itch (but not always). The skin feels like it can't breathe and sweating/perspiring makes the condition even worse! Perhaps that's why Effinex initially refused to enter the snug starting gate...idk. I agree, they should have scratched Effinex from the race! He was in no shape to run, causing more stress to the body as well as aggravating the condition by sweating! I'm surprised he even came in 3rd! Background: I helped a horse with severe "mega hives" where the hives had connected to form huge patches of wheals/edema. I consulted with an equine veterinarian in California on the medical treatment for hives in horses...it was the same as treating human urticaria. Unless you have suffered a severe case of hives yourself, (which I have), it is hard to understand the frustrating discomfort and agony a person or animal is feeling. It's unfortunate that horses (animals) can't talk. I never had hives (knock on wood, and praise the lord), but my son had a severe case of "giant hives" when he was about 8 months old. Babies do not have the concept of stoicism or suffering in silence, so I know it's uncomfortable. The only thing that gave him any relief was holding him in my arms in the neighbor's swimming pool with him submerged up to his neck. That's probably why your little boy found relief in the swimming pool. As soaking the affected skin with water that is cool, slightly below body temperature is part of the treatment to help provide temporary relief from the hives. Unfortunately for the horse I helped with severe hives, there was no tub big enough at the stables and I resorted to using several huge beach towels and snuggly fitted the towels all over the horse, especially her belly and thoroughly soaked the towels with the cool water/baking soda/epsom salt solution. These soaks were done daily if possible. During the soak process, I also gave the mare a soothing facial and neck massage to help relief stress. She melted in my hands and loved the "spa" treatment The mare patiently stood for the 45 min-1 hour process, knowing I was helping her. We also had to simplify her diet to just basic hay until her condition improved...where we slowly added one new food product or supplement/week. At the same time, we changed the type of bedding and poured neutralizing baking soda into the stall subsurface (sand/clay) to remove any acidity due to urine. Contact with acidity exacerbates the condition. I'm not sure what medications vets for race horses use but some vets use accupuncture to treat hives. The owner of the horse (and myself included) didn't want to use oral medications (i.e. antihistamines) especially steroids like prednisone as it can have an adverse effect on the body's system/organs on the long run even if it was used for a short period of time. Instead, a solution of water mixed in with topical Triamcinolone was lightly sprayed to the worse areas of the body. The horse improved dramatically with each spa treatment! Wow. Graphic pictures. Thanks for sharing. That poor mare sure looks miserable in the first picture. Glad you were able to help. They definitely should have scratched Effinex. Racing is hot work for the horse. Poor guy. Fortunately, my ex-coworker's mother was an equine vet in California and she had treated horses with hives (sport horses I believe). I discussed the clinical procedures my allergist used to treat my severe urticaria and she concurred that it was the same methodology she uses on her equine hives patients. As the mare wasn't showing severe itching, we both opted not to use steroids like prednisone (which the allergist administered in my severe case of insane itch) as it really screwed up my blood readings after only 2 weeks of its usage. Luckily, I was able to teach the horse owner and a few young riders at the stables on the steps involved in the soak process just incase I couldn't go down to the stables. But...back on target, in reference to Effinex...apparently the track vet had no clue and definitely never personally dealt with hives him or herself to know how insensitive the decision was to still run Effinex in the race. The possibility of the hives turning into an internal condition can result in anaphylactic shock which can be lethal as the internal swelling can close off the airway (I should know). Just my unprofessional opinion but I "really feel" for Effinex in the deepest sense of the word. Hives is an autoimmune issue. With injury or allergic reactions, the body's tissues/cells produces compounds (histamine) formed by the body's immune system (mast cells) that results in tissue irritation, stimulates gastric acid secretions, muscle contractions and dilates the blood vessels. The body reacts in a similar way under stress. 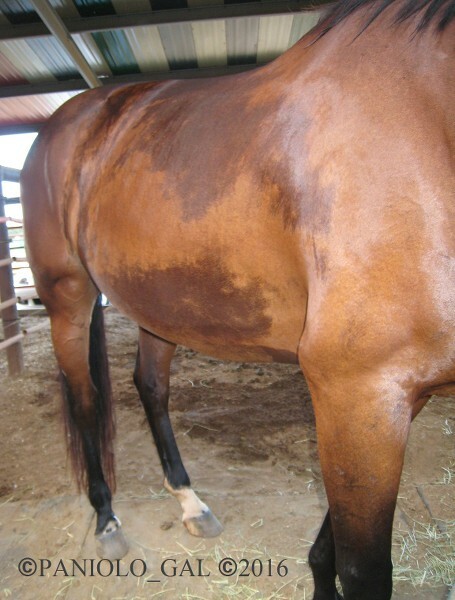 Therefore, when an individual or horse/animal who is dealing with active hives but is still subjected to stress, it exacerbates the situation, and prevents or slows down the body's ability to heal! An unprofessional opinion but based on personal experience, would be to send Effinex to a quiet farm environment away from the stressful atmosphere of training centers with close quarters. 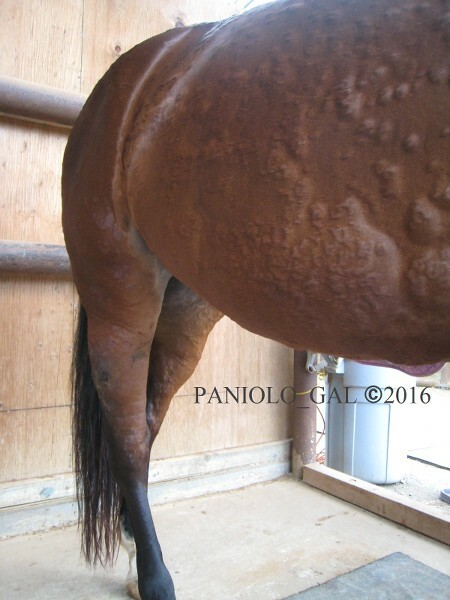 One of the first things I've consistently read about hives on horses which was confirmed by the California vet was to immediately change the environment of the hives patient. If changing the environment is not possible, then locate the horse to a quieter area of the stables and at least replace the type of bedding as a basic minimum for a change. A must do which was mentioned earlier: simplify foods to the very, very basic with no added nutritional supplements until the body's turmoil settles down...aka a bland diet of hay only! Once the body settles, then you can do sensitivity skin patch testing if financially feasible. If not, then to help problem solve for the possible antigen(s)...slowly add one new food or supplement per week and check for any reactions. This is time consuming, but it is healthier than having the body subjected to antihistaminic medications which is only a cover-up and does not deal with the cause. This is why many vets use accupuncture as a speedy alternative...but sometimes it doesn't work if the antigen is still bombarding the body's environment or internal system. Sorry for adding in more to this long story but thought these shorter segments might be easier to absorb. Hives, especially severe hives, is a whole 'nother realm in regards to health issues for sure! Multiple graded stakes winner Effinex is looking for the first win of his 5-year-old campaign and he got the stamp of his approval from his breeder, who also is a veterinarian, on the morning before he contests the $750,000 (G2) Oaklawn Handicap on Arkansas Derby day. “He's pretty talented and pretty competitive. We all feel that Effinex is a very nice horse,” said Dr. Richard Cohen, who is handling hot walking chores for the son of Mineshaft this week as well. ....made his only previous 2016 start at Santa Anita, he developed a brutal case of the hives. “I own that,” said the veterinarian, who said that they used cedar shavings as bedding and feel that caused the reaction. Mike Smith, who has ridden Effinex for his last three races, will jet from California to ride. Effinex wins the 2016 Oaklawn Handicap Saturday. owner Tri-Bone Stables and trainer Jimmy Jerkins! Effinex & Jimmy Jerkens win back to back Suburbans. Last trainer/horse to do that was Allen Jerkens/Devil His Due 93-94. Jimmy Jerkens talking about how much winning this race means, watching his father win it so many times as he was growing up. "Those old handicap races meant so much to him." Effinex scored a repeat victory in the Suburban Handicap at Belmont Park on July 9, 2016, defeating Samraat by a neck. 104 for Effinex in the Suburban.....98 for Catch a Glimpse in the Belmont Oaks....and 104 for A.P. Indian in the Belmont Sprint.